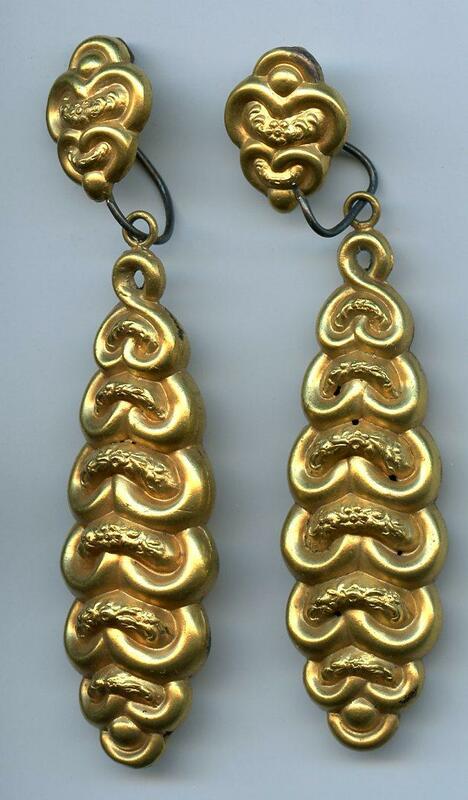 Gilt plastic ear-rings worn by Miss Enid Holland in pantomime 'Cinderella', performed at Stationery Hospital, Wimereux, Christmas 1916. Enid Walker (nee Holland), enrolled as part of Surrey/102 on 20.10.14 at was selected for service 1.11.15. She served at Benfleet Hall Red Cross hospital, Sutton 10.6.15 - 24.5.16 and in France at no.4 Stationery hospital, Wimereux 27.5.16 - 11.4.17 and no.8 Stationery hospital, at Paris-Plage 11.4.17 - 27.12.17.